TVision announced a new initiative at the 2019 Summit, a “10 years plus club” for any clients we have been in partnership with for, you’ve guessed it, over 10 years ….. It was such a great feeling sending out the thank you certificates as well as a thank you hamper from Fortnum and Mason to this exclusive group. Each January we will be adding more and more members to this group – as our way of saying thank you to all of those individual that we have such great working partnerships with. Our Consultants know the platform inside out. They regularly meet with our clients to inform them of new functionality and ways that TVision can support new and existing internal challenges and projects. We are proud to say we have received many thank you messages from happy clients who have received their hamper and certificate. Many are now proudly displayed around offices up and down the country. Several were presented at our Summit in January to clients who were able to attend, despite the risk of dreadful weather. It has been a fantastic 15+ years working with you guys and we are hugely proud of everything we have achieved together. A perfect example of teamwork and working in partnership to make technology shine. 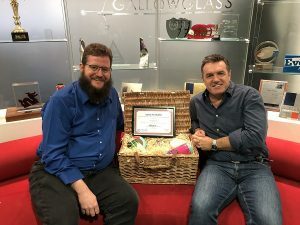 Here’s a picture of Darren Thorley the Head of IT and also Nick Grecian the MD with the hamper and their certificate. Our relationship will continue to go from strength to strength. The team are all so proud to be able to support the journey that Gallowglass have been on to date. 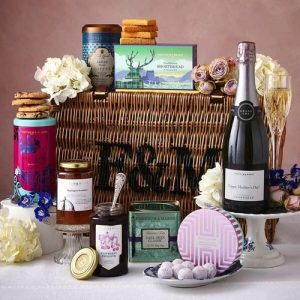 Fortnum and Mason Hamper available here.